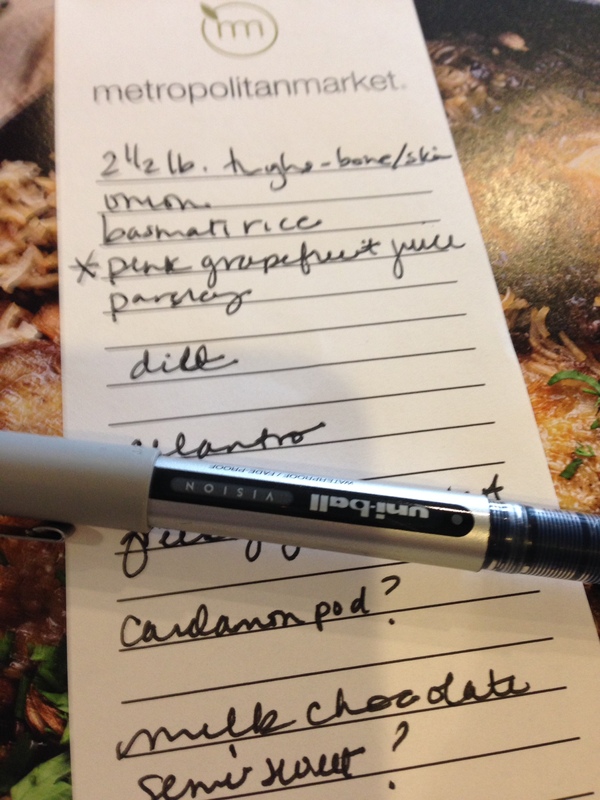 Shopping list for last week’s dinner. ? means look in the cupboard first! I think the only nut is me but almost every Sunday I cook family dinner to which my parents and brother (and their dogs, Maxwell and Dutch) have a standing invitation. Sometimes to broaden our circle I will invite others but frequently it’s just me, Jack and my mom and dad. Cocktails are always at 5:00, with dinner following shortly after. The whole affair is wrapped somewhere in between 7:00-8:00, because when you’re getting together weekly, it doesn’t need to last for hours. I started this “tradition” a year and a half ago when my mom’s back was bothering her and she was feeling housebound. I invited them to dinner on a Sunday at 5:00 and served simple but delicious Chicken and Noodles (a la Maidee Watson). After we were done, I thought, “I should do that again next week” and here we are. It seemed like a great way to utilize (ahem, justify?) all the cookbooks I’ve amassed, do a little cooking therapy and see my parents and brother, which when you work 40+ hour weeks can be tricky to do. Occasionally if Sunday night is busy with other activities, we will do lunch instead (Jack’s got a killer Rueben recipe!). There are three four components to my menus: Cocktails, the main course (including veg and if needed starch and bread), dessert and the table settings. I don’t do hors d’oeuvres because most of us don’t have the appetite for a snack and then dinner and I usually serve dinner soon enough after the cocktails that I am not concerned. The exception is in the summer when I serve margaritas, I’ll make guacamole, of course! I’ve learned the hard way to decide on a cocktail on Saturday because if it’s a new recipe and it needs testing, you’ve only (or at least I’ve only) got a few opportunities to get it right before it all goes downhill. Tonight I’m serving Jameson and ginger ale because I don’t think serving my parent’s Irish Car Bombs would be a good idea. My stand-by and crowd favorite is a Manhattan. A few weeks ago I served a Nacho Vidal from Bon Appetit which was a hit and the bonus was they could be mixed up in a pitcher versus made individually. If I don’t have a menu in mind (based on what’s in my cupboards or freezer) by the time the weekend rolls around, then I start perusing cookbooks Saturday morning. I try to pick one new or edgier recipe one week followed by a more traditional/favorite the next week. 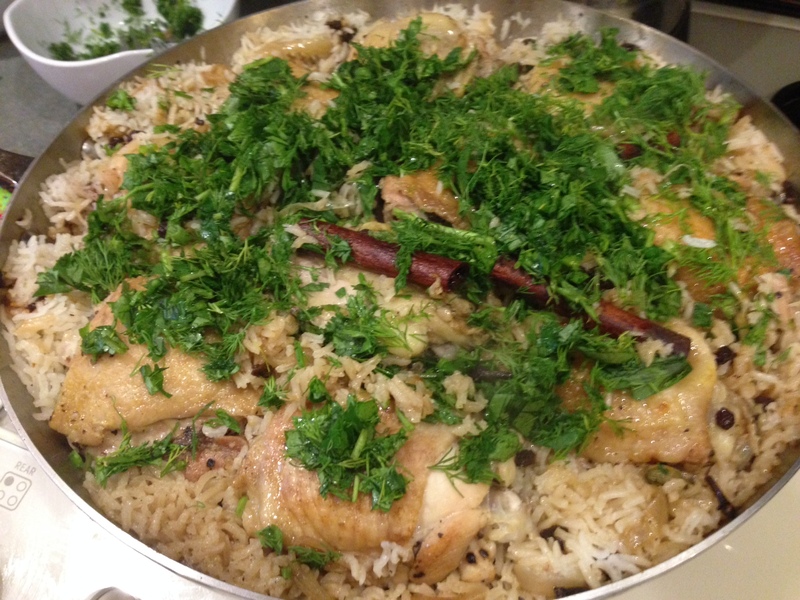 Last week I made Chicken with Cardamom Rice from “Jerusalem: A Cookbook” by Yotam Ottolenghi and Sami Tamimi (go buy it now!) that I wasn’t sure would float, but everyone enjoyed it (my brother pushed the currants to the side of his plate). I figure if it doesn’t turn out or everyone hates it, we can always order pizza, right? Tonight, there’s a Wagyu Corned Beef bubbling away in the oven (Cooks Country) which I will also serve with a side of mashed potatoes as well as with the boiled red potatoes, carrots and cabbage. If the dish warrants a starch I’ll usually default to mashed potatoes because my dad LOVES them. A few weeks ago I switched it up and made Deb Perlman’s mashed Yukon golds with browned butter and buttermilk that were fantastic served with tomato glazed meatloaf . Depending on the maindish, I cook a vegetable and usually also make a green salad because I love a simple romaine salad with a lemony mustard vinaigrette and parmesan. Because my dad is not a green salad fan, I’ll do broccoli, Brussels sprouts, asparagus, beets, etc. but I will frequently serve them with a flavored butter or vinaigrette so they have a little kick. Most weekends, I make two loaves of bread from the amazing book by Ken Forkish, “Flour, Water, Salt, Yeast” (go buy it now!) 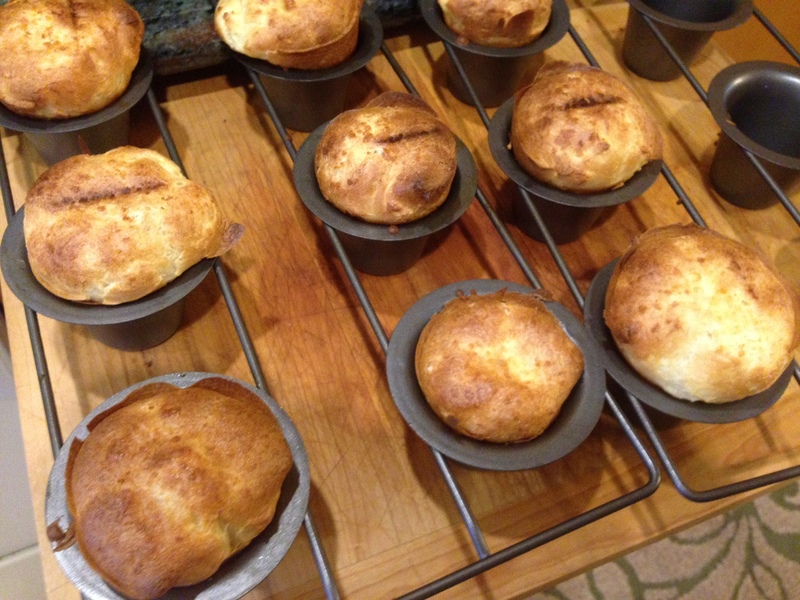 or if the meal doesn’t lend itself well to bread, I’ll make popovers which are a favorite and so much easier! Tonight with our corned beef we’re having Irish Soda bread. Dessert can be as simple as tonight’s Barefoot Contessa Chocolate Chunk Blondies or as elaborate as the Maida Heatter chocolate cake I made last week. One week I served all the leftover bits and pieces I’d frozen from previous dinners, not the biggest hit, but it sure was easy! Soon the rhubarb will be ready and we’ll have four to five weeks of rhubarb desserts. 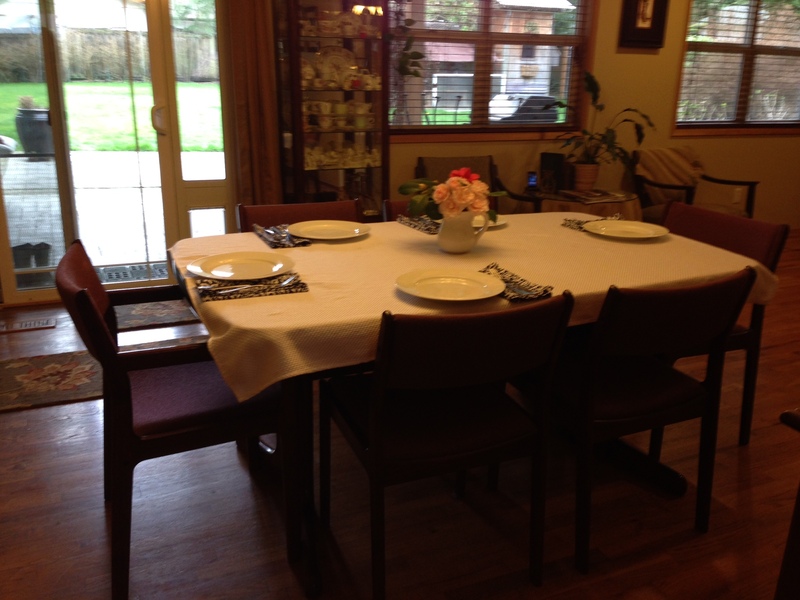 I set the table every week, trying to make it a step up from the weeknight and not as fancy as the holidays. I own a lot of white serving pieces (bowls, platters, etc.) and my everyday dishes, as well as my china, are also white, which makes it so easy to change the look with a tablecloth or placemats and the food always looks good in white. I rarely serve the main dish from the pot, unless it’s something that would be risky to try to transfer to another dish. Because I am the daughter of Ida, I also own a lot of stemware, so cocktails are always in a fancy glass. I try to find fresh flowers from my yard or the store but I loathe to spend a fortune on them. 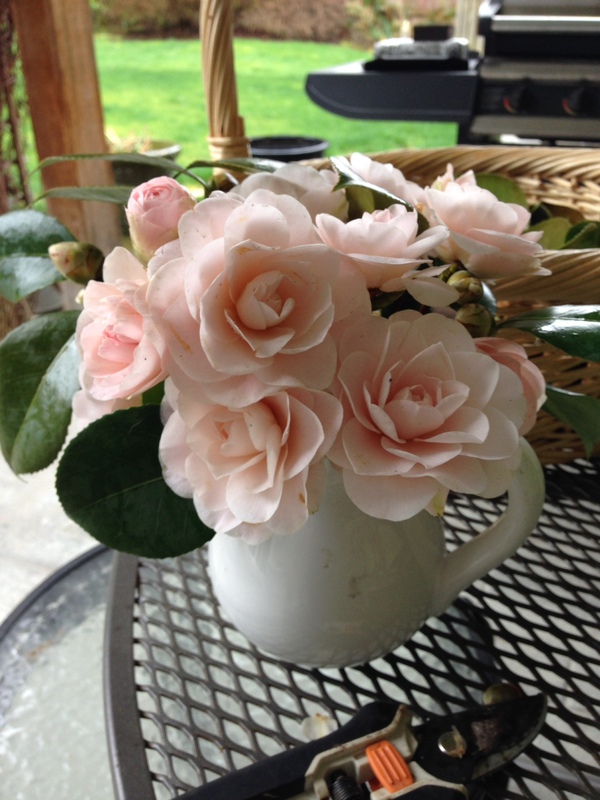 Last weeks camellias were courtesy of the vacant house at the end of the street. If I was honest, I would say there are five components to family dinner, because the clean-up is definitely part of the deal. Jack usually helps me and and all those dishes I did as a kid also helps, because, I don’t want to boast, but I can wash dishes/clean a kitchen in record time. Monday night is usually spent unloading the dishwasher and putting all the serving pieces away in my sewing/dish storage closet, while hopefully eating leftovers! The reality is, it is a lot of work to have people for dinner every week but it’s work I love. It does not need to be as elaborate as I make it but that’s the fun part for me. Now that the kids are grown and gone, I’m not really sure what to do on the weekends, and this fills my time and fulfills the creative side of me (and allows me to justify my cookbook/kitchen tool habit!). And I get to spend time with people I love. Maybe someday more people I love will be around to come for cocktails at 5? Look at the time, I’d better get going. Invite someone to dinner next week! Narrowing down the choices, the chicken won over the short ribs last week. Had a lot of broccoli in my fridge. 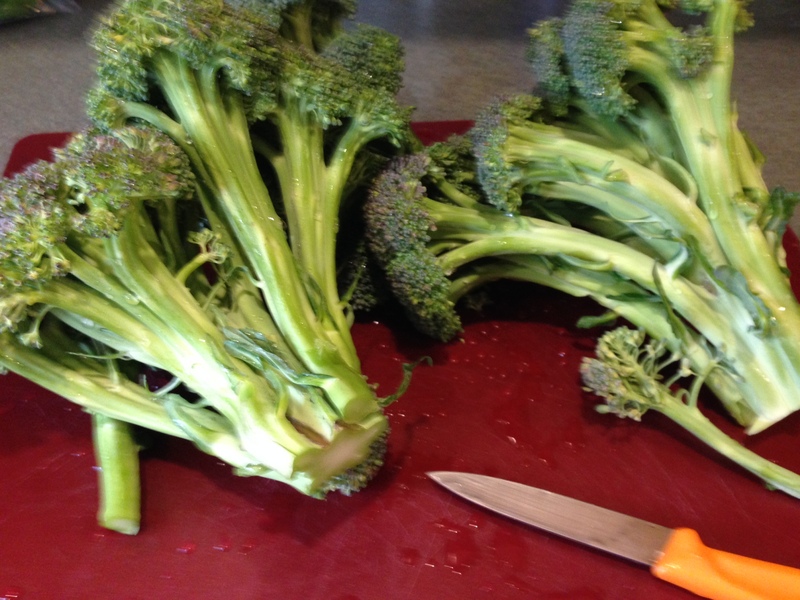 Remember to peel and cut up the broccoli stalks, too. They have more flavor than the flowers. Eggs make magic. If you’ve whipped egg whites into stiff, glossy peaks, you know this. If you’ve ever put a souffle in the oven, and then pulled it out, puffed and golden and melt-in-your-mouth delicious, you know this. If you’ve ever made a Dutch baby, or a German pancake, you know. And this is why I am obsessed with popovers. With some flour, milk, butter, and most importantly, eggs, a popover recipe gives you a bread to go with dinner (or breakfast or brunch), with minimal planning, impressive results, and so little effort is feels like cheating. Plus, they are so cheerful! But the most addictive part is the way they, well, pop out and over, thanks to the egg action. The addiction factor was a strong player in my weekend cooking. I made popovers twice this weekend to go with soup for dinner (French lentil and a roasted parsnip/cauliflower). My first round was using the recipe from Good to the Grain by Kim Boyce. Have you purchased this cookbook yet? It is inspiring. Also, the recipes yield delicious results. If you’re anything like me, when you get your hands on this book, you’ll pretend to yourself that you are reasonable person and look for recipes that use flours you already have (like rye, so you’ll make the infamous Rye Crumble Bars a couple of times), then you’ll focus on recipes that use a new one you acquire just for that purpose (maybe barley) and then you’ll just give in as your fridge becomes taken over by a whole litany of alternative flours. And this point, you can make the multigrain mix that Kim Boyce calls for in her recipe for multigrain popovers! Luckily, you can use this mix to make her recipe for multigrain waffles (they are good) and a number of other treats that I haven’t tried yet…but it is only a matter of time. Anyway, those popovers were good. They were especially good ripped open and liberally sprinkled with freshly ground black pepper. However, even as I was enjoying them, my mind couldn’t help wandering to the block of sharp cheddar cheese in the fridge, and imagining the possibility of a merger and acquisition between the two. 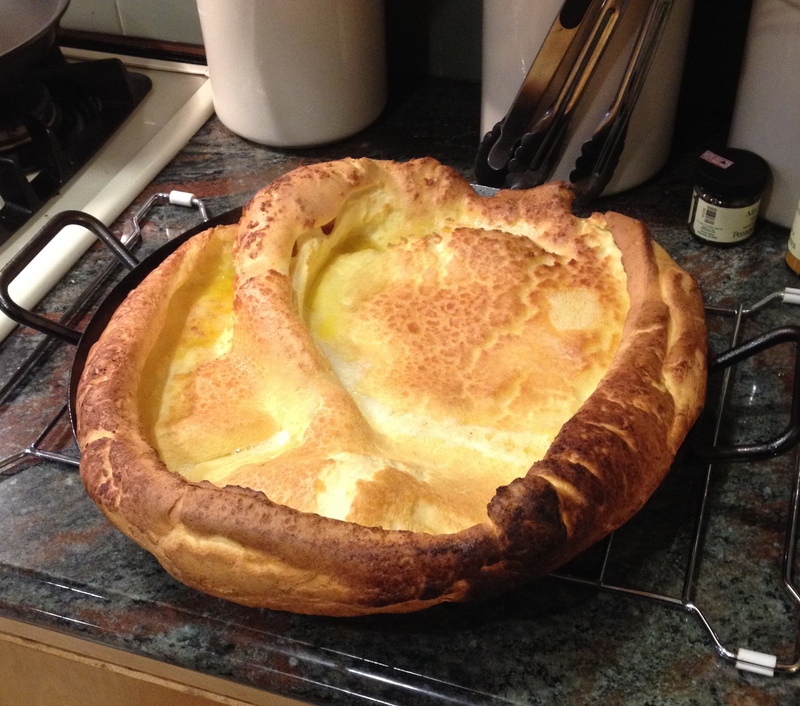 So, Sunday’s dinner brought more popovers. This time, I opted for a less-rich version of the recipe from the Joy of Cooking, only still with the multigrain mix from Good to the Grain, and a sprinkling of cheddar cheese. Darn it. Just thinking about how tasty and easy these are…I might just have to go make more right now! You should, too. adapted from the Joy of Cooking by Irma S. Rombauer, Marion Rambauer Becker and Ethan Becker, and Good to the Grain by Kim Boyce and Amy Scattergood. Preheat oven to 450. 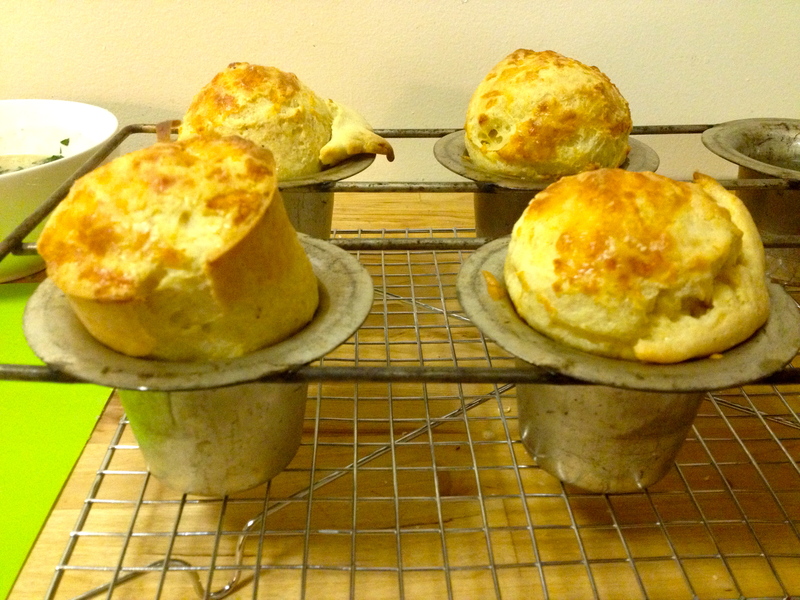 Butter a popover or muffin tin. Whisk together the flours. Whisk the eggs, milk, and butter to combine in a separate bowl, then pour over the flour mixture and fold together until just blended. Fill the popover tins 1/2 full, divide cheese among them, and cover with remaining batter. Bake for 15 minutes at 450, then reduce the oven temperature to 350 and bake for 20 more minutes, until well browned and crusty. Leave those guys alone in the oven without opening the oven door for the last 5 minutes of baking. Serve immediately. The recipes I looked at say this should make 8 popovers, but I always got 7. Actually it’s Gnocchi in Tomato Broth, but upon further reflection–and after having cooked and eaten this dish four times, I think I know why I like it so much–potatoes and tomato sauces are delicious together. 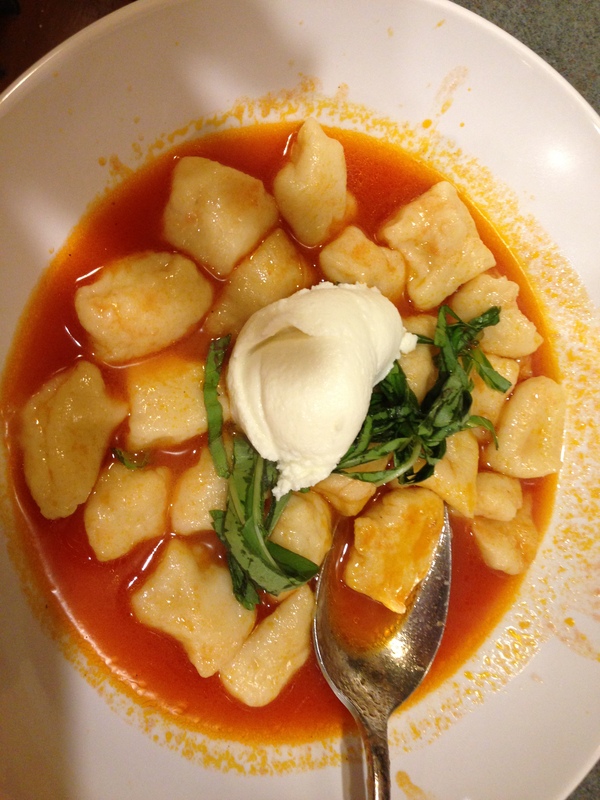 Tender gnocchi (potatoes and flour) with the most subtle, rich, delicious tomato broth, EVER. I’ve ordered gnocchi in restaurants but usually with a rich, creamy sauce which is just too much when paired with the richness of the gnocchi. This tomato broth cuts the richness of the gnocchi making the perfect combination–like french fries and ketchup or dare I say, hash browns and ketchup? but don’t worry, I will never say mashed potatoes and ketchup–that just seems wrong. 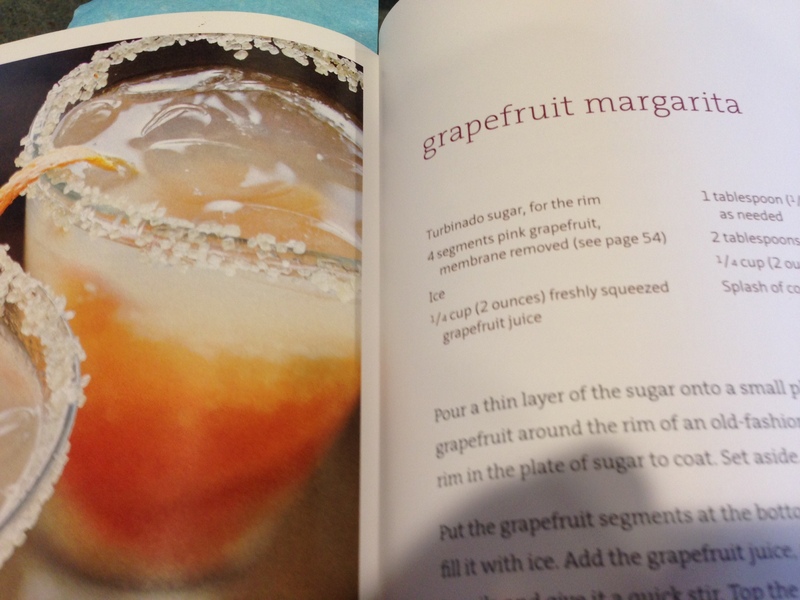 Megan and I first made this recipe from the The Smitten Kitchen cookbook by Deb Perelman last Christmas Eve. I made it one other time last winter and then Megan and I made it again in October when I visited her and John in Cambridge. We were smart this time, and froze half of the gnocchi but slurped down all the tomato broth so on my last day in town when Megan and John were both working, I made another batch. It was a relatively warm autumn day so I had the back door open, workman were doing some sort of brick work to their building and when one of them drove by on his little tractor type vehicle, he said “Shuh , smells good in thah”and indeed it did! The recipe is not difficult but I do not recommend it for a weeknight meal–I’ve tried it–you eat at 10:00 p.m., but it is a perfect recipe to make on a weekend and if you can bear not consuming it that day, freeze it or freeze half of it. You start by baking potatoes for the gnocchi and while they are baking you make the tomato broth. It’s sort of like making chicken stock but with tomatoes. 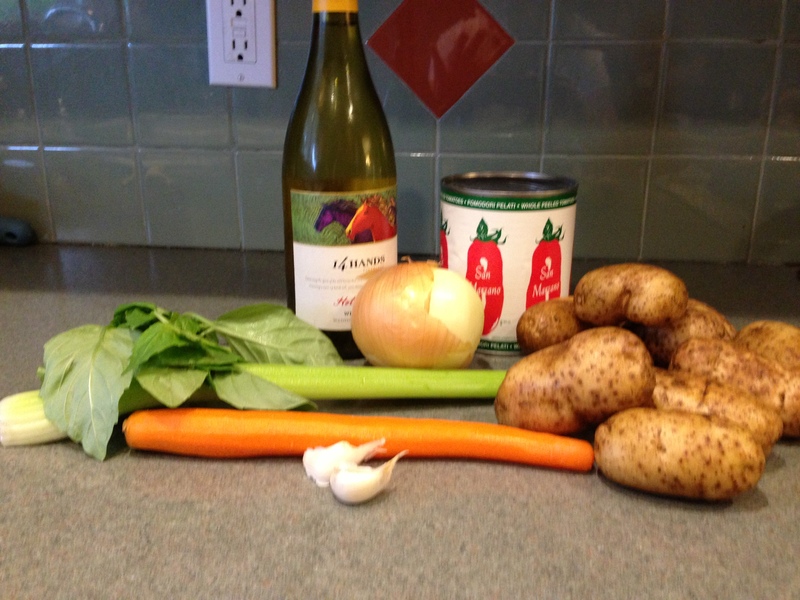 You saute onions, celery, carrot and garlic and then add white wine, chicken broth and whole tomatoes. You cook it until it thickens (about 40 minutes) and then strain it, unfortunately, throwing all those ingredients away, leaving you with a beautiful tomato broth. 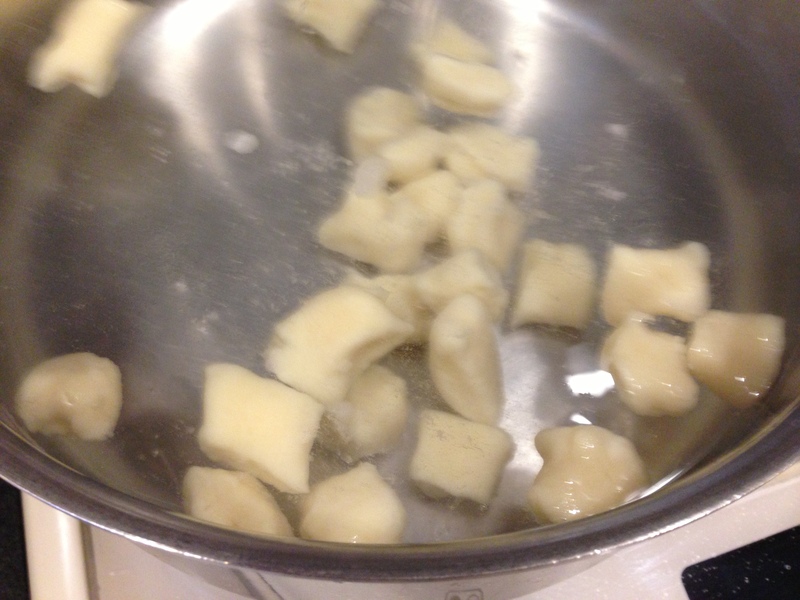 The gnocchi is a simple mix of riced or grated potato, egg and flour. For a non-holiday meal, I forgo making it fancy (rolling it over fork tines) and just cut it into 3/4 inch pieces. 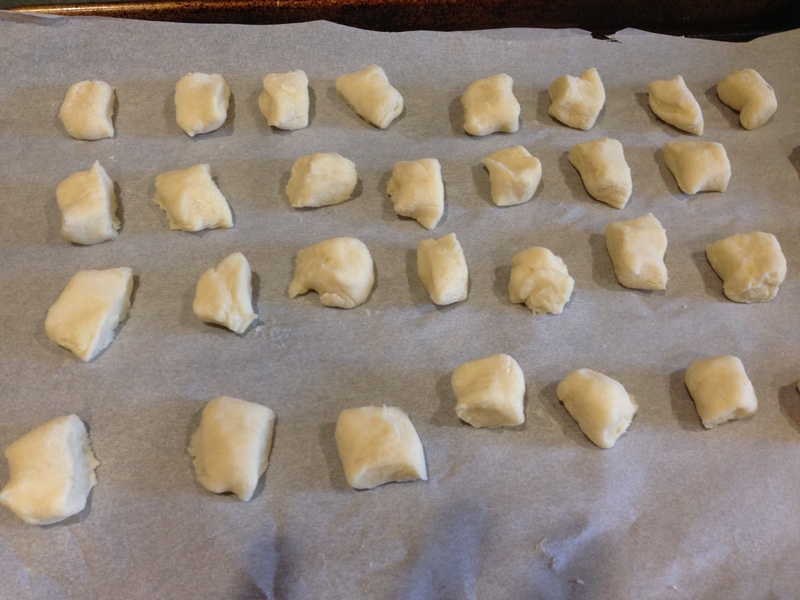 The gnocchi are boiled in salted water until they float and then are drained and added back to the broth (or put on a parchment lined baking sheet to freeze until solid when they can be placed into a freezer bag) If you decide to freeze some of the broth, put it in a freezer bag, lay it on a baking sheet, place it in the freezer and you’ll have a nice flat bag of frozen deliciousness. Make it, it’s wicked good! When they float to the top, they’re done! 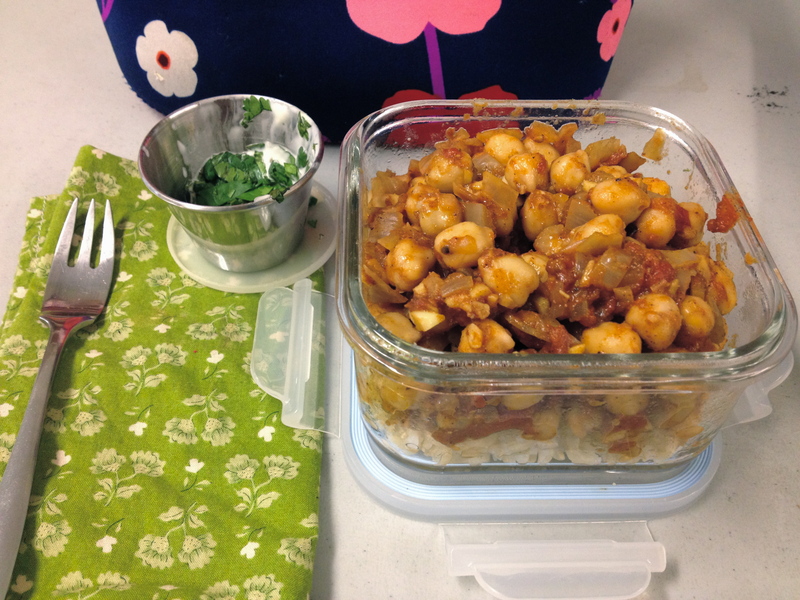 On pretty much a weekly basis for the past five years, when John and I ask each other what we should have for dinner, “spiced chickpeas with ginger” comes up. It’s also not unusual when Stephanie and Jack and I are planning on dinner together for this recipe to be tossed out as an idea. While it may have been an exotic way for us to fuel our spice purchasing addiction at one point, now it just feels like a homey family recipe. One of the reasons this recipe has elevated itself to staple status is that it can be made from basic ingredients I tend to have on hand anyway: cans of chickpeas, a can of tomatoes, garlic, onion, spices, ginger (ginger can keep for quite awhile if you stash it in a cupboard rather than the fridge), rice, lemons, and cilantro. Oh, and a touch of mayo — it sounds crazy, but it really elevates this to a wonderful level of deliciousness. You can call it aioli in good conscience if it makes you feel better. This meal also makes wonderful leftovers the next day in your lunch. That is, you should have plenty of leftovers if you don’t always end up eating more of it than you intend to…luckily I stopped myself in time last night! Start the rice. Use this method: Bring a large pot of water to boil. Rinse the rice and add it to the pot to simmer, uncovered, for 30 minutes, or until tender. Drain. Add it back to the pot and cover it to steam for another 10 minutes. Voila. The easiest brown rice ever. For the chickpeas: Gather all the unprepped ingredients on the counter. Heat the olive oil in a large skillet over medium-low heat. Add the chopped onion and cook until translucent, 10-12 minutes. You can prep, measure, and chop the rest while the onion cooks if you have everything at hand and work quickly. To a medium bowl, add the ginger (try peeling it with the edge of metal spoon — it works great), the minced garlic (setting aside half for the garlic mayo), the chopped tomatoes (drain the liquid into a measuring cup), the bay leaf, spices, and salt. Once the onions are browned, add the tomato and spice mixture, and cook for about 5 minutes. 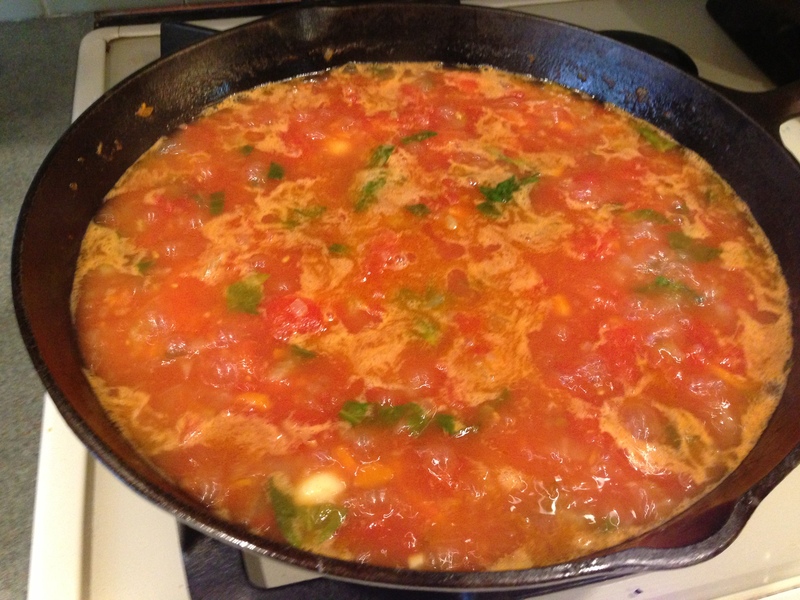 Add enough water to the tomato liquid to equal 1 1/2 cups. Add this, along with the drained chickpeas to the pan, and simmer until thickened to a sauce-like consistency, about 10 minutes. Taste for salt. Don’t burn your tongue. Meanwhile, zest and juice the lemon, adding it to the mayo along with the reserved garlic. Set aside. How is your rice doing? It is probably done at this point. Dish up. 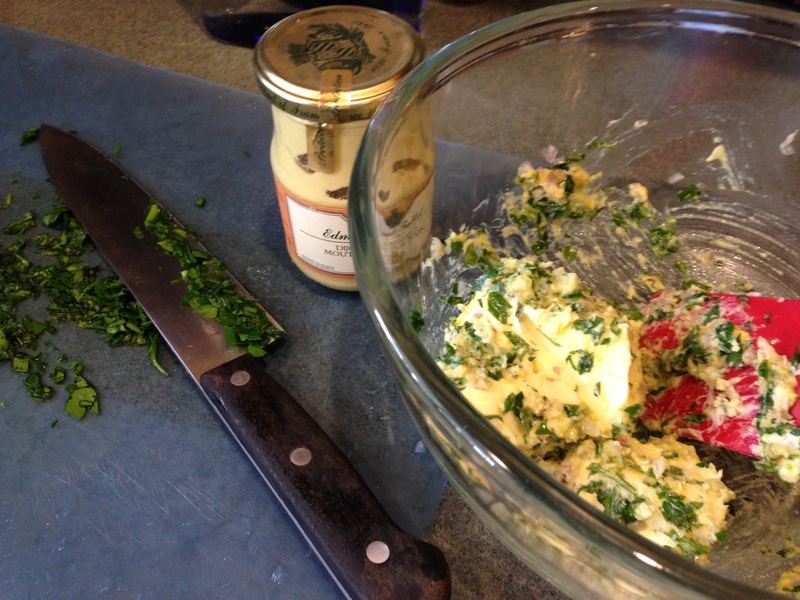 Add a spoonful of the mayo…I mean, aioli, and sprinkle on that cilantro. Enjoy! Here is a confession that will come as a surprise to nobody: I am a rule follower. Up until very recently, I earnestly followed recipes, measuring each spice and seasoning, setting timers, and not allowing myself to riff too much on what was written. Not that much has changed. I’m still a rule follower… in so many ways. But somewhere in the time lapse of so many meals cooked and enough cookbooks consulted, I have internalized a larger set of rules that are helping me break away from the written recipe scripture. 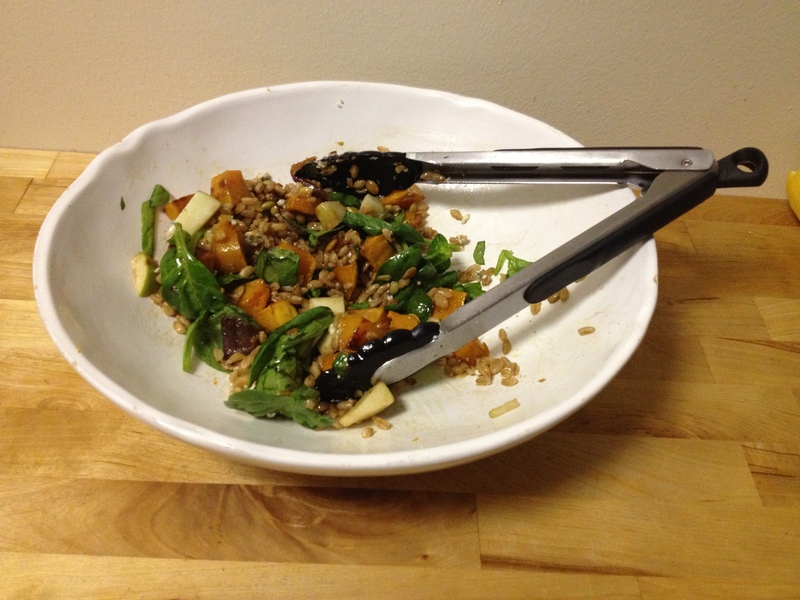 grains + leaves + protein + seeds/nuts + vinaigrette = YUM. The equation gets even yummier if you toss is something roasted, some fruit, and/or something cheesy. This is what I did. I put the “recipe” below, but really, you can do this without it. But all you rebels out there already knew that. Created by Megan Knottingham. Yes, she googled it afterward and was not the first to dream up some of these things in combination…nonetheless, this is her version. Preheat the oven to 425°. 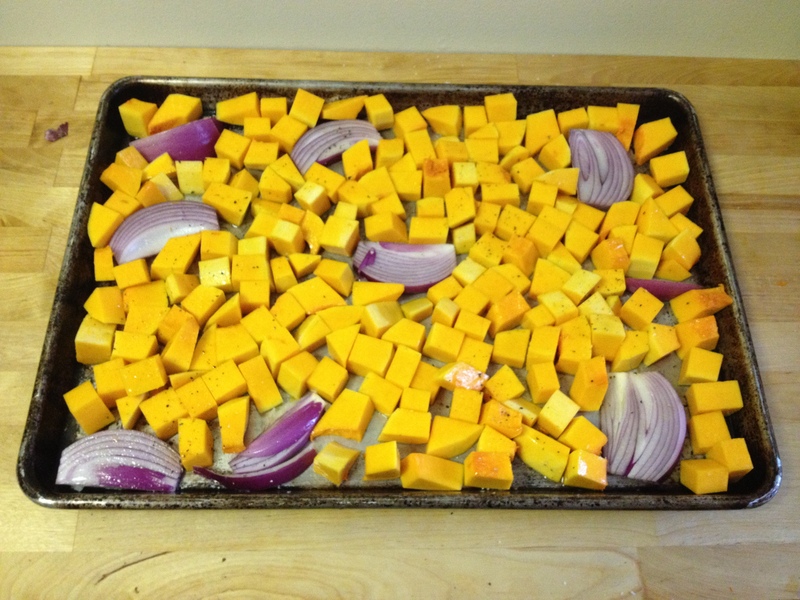 Toss butternut squash cubes and red onion wedges with 1 to 2 tablespoons of olive oil, two big pinches of kosher salt, and some pepper on a large rimmed baking tray. Roast until the squash gets some crispy brown edges and the onions are melted and caramelized, about 60 -75 minutes. Stirring about every 20 minutes to ensure even browning. Let cool slightly or until room temperature. You can also roast your veggies ahead of time — the first time I made this, I roasted the squash the day before, and heated it up slightly in the microwave before combining it with the other ingredients. Meanwhile, prepare the farro. Rinse the dry farro. Add it to a medium pot with 3 cups of water. Bring to a boil. Cover and reduce the heat to a simmer. Cook for about 15 minutes, until al dente. Drain, then put into your serving bowl. Whisk approximately 1 teaspoon honey, 1 teaspoon mustard, 1/3 cup balsamic vinegar, and a pinch of salt together. Whisk in olive oil until it tastes to your liking (I filled my container up to the 2/3 cup mark). Toss the roasted vegetables with the farro and apples. Add big handfuls of spinach and the vinaigrette. Top with pepitas and blue cheese if you feel like it. Pour a glass of something delicious. Dig in! These past two months have gone by without posting, but not without cooking. Luckily for me though, a lot of it has been done by John! Since he finished the semester back in the middle of May, he has been making a number of tasty creations, including these chickpea sandwiches, green smoothies with almond milk, and a number of pizzas. There has also been a number of new favorites from some of my favorite cookbooks, including David Lebovitz’s Ready for Dessert, The Smitten Kitchen Cookbook, and The Sprouted Kitchen Cookbook. I highly recommend all of them! 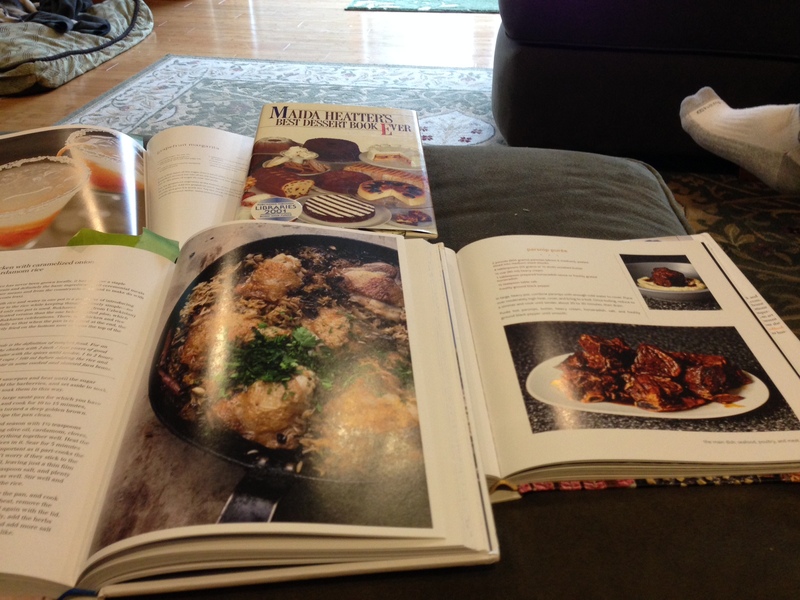 I’ve had a lot of fun exploring recipes from these books. My favorite recent meal was the Pozole with Green Mole from Vegetarian Cooking for Everyone (the cooking bible from Deborah Madison). Actually, this is one of my favorite dishes of all time. This is not the first time I’ve made or consumed this dish (Stephanie was the first to make this one), but this time around, I was struck by how quick and easy it actually is, especially when using canned hominy. 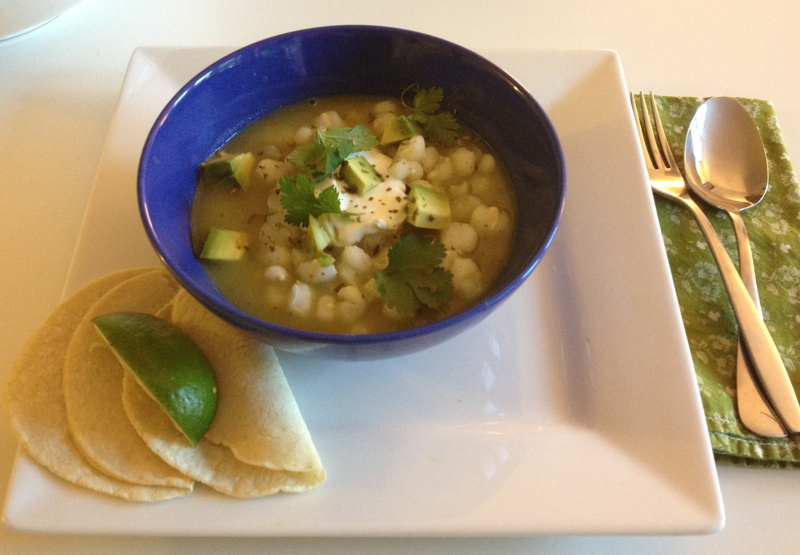 Is making pozole from scratch, versus using canned hominy, worth it? Yes. But you shouldn’t not make this because you don’t feel like making the dried stuff from scratch. Just use the canned stuff. It is still incredible. When you’re feeling extra ambitious, go ahead and make the pozole from scratch. And even though there are a number of dirty dishes, this recipe is so fun to make. The green on green on green ingredients are so pretty, the tomatillos are wicked cute, and you’ll feel like you’re making a magic potion when you add romaine leaves to the sauce and then fry it. But it will seem the most magical when you finally taste the finished product. Drain the hominy. Add it to a pot with 5 cups of water, along with the minced onion and garlic, and salt to taste (I’d start with ½ teaspoon of kosher salt). Simmer for approximately 20 minutes (while you are preparing the mole). Add water in ½ cup increments if the pot gets a little dry. If you are using pepitas/pumpkin seeds that are already roasted, you can go right to pulverizing them in the food processor. If they aren’t toasted yet, toast them in a skillet on the stove top first before grinding. Set aside. 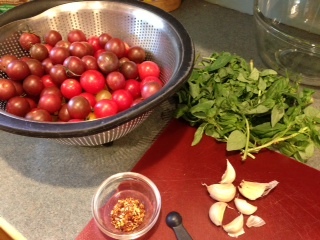 Cook the tomatillos in boiling water for 10-12 minutes, until they are dull colored and soft. Drain. 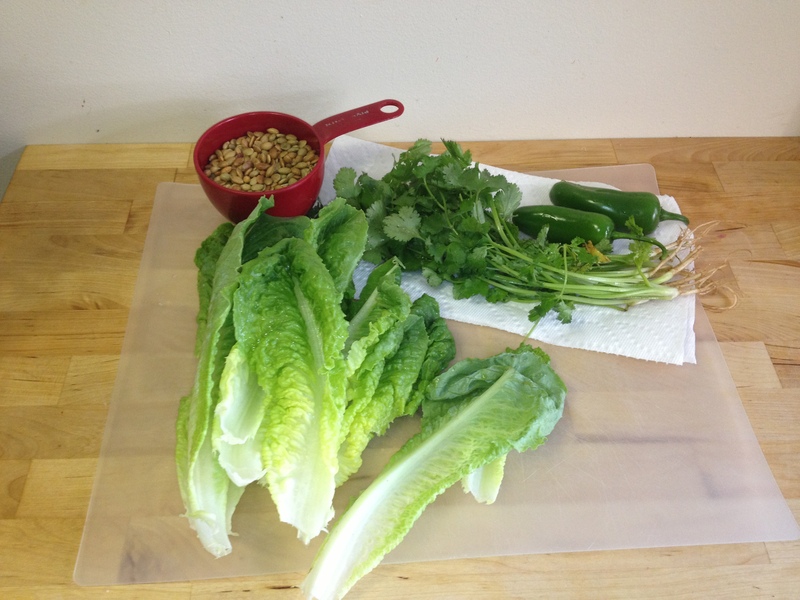 When cooled slightly, add to the blender along with the romaine leaves, jalapeños, cilantro, and a cup of water. Press your favorite blender settings to juice it up. You now how a blender full of delicious green. Heat a tablespoon of oil in a large skillet. Add the mole, and stir frequently. Cook for about 5 minutes. Add the ground pepitas, and fry for about 12 minutes, until thickened. Then, strain it through a fine mesh sieve. Discard the solids. Taste for salt (the mole might taste quite bitter and spicy at this point – don’t worry. It will be magical when paired with the slightly sweet hominy). Taste the simmering hominy for salt. Depending on if you used salted pepitas earlier, your mole may have some salt in it, but probably not enough if the hominy tastes flat. Add the mole to the hominy and stir it all up. Serve with your favorite garnishes. I like Mexican oregano, avocado, lime, and cilantro — it carries the green theme through, and they just taste right. Some people add sour cream, but I think that actually muddies up the flavor, so I don’t add that anymore. Homemade corn tortillas or corn quesadillas on the side are marvelous. Beer is a great beverage to consume here. Droopy Doodle is wondering what happened to her garden. I have yet another confession to make, no, nothing from this post was pulled out of the trash, it’s even worse, I am filling in my garden with, *gasp*, grass. Sorry, I know it goes against all the current trends and Sunset magazine will probably revoke my subscription if they find out but I have too much yard to take care of by myself and I am not married to a man who likes yardwork. I enjoyed the vegetable gardening thing for awhile, I grew radishes and green onions and kale with pretty good success and I grew great crops of cherry tomatoes. But other than that, I spent a lot of time weeding, watering, picking worms out of cabbages and trying to outsmart the chickens. Their entire life’s mission is to get into the garden so they can pull out every seedling and eat every flower. So this weekend, all the herbs were moved or repotted, four yards of soil was spread and grass seed and peat moss were sprinkled. Ironically, until this weekend I have not missed anything about not planting a garden until I decided to make the Barefoot Contessa’s Summer Garden Pasta for family dinner on Sunday. $5 a pint–which is probably a bargain. I first made this recipe a few summers ago when I had buckets of cherry tomatoes all ripening at the same time as it takes a whopping four pints. 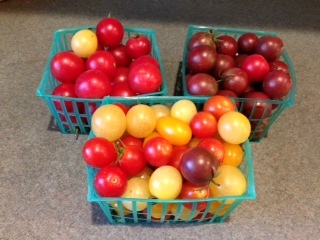 Yesterday at the local farm stand when faced with forking over $5 a pint for organic tomatoes, I decided three pints would do just fine. If you are an order Muppet like me, you can start this dish in the morning by preparing the tomato marinade and then head out for a bike ride or some yard work and still throw together an awesome dinner. The tomatoes are marinated with the olive oil, basil, garlic and red pepper flakes for about 4 hours which makes your entire house smell delicious and makes those you live with think you are a culinary genius. You finish it off by cooking a pound of angel hair pasta and then mix it together with the marinade and copious amounts of freshly grated parmesan. Couldn’t be easier! 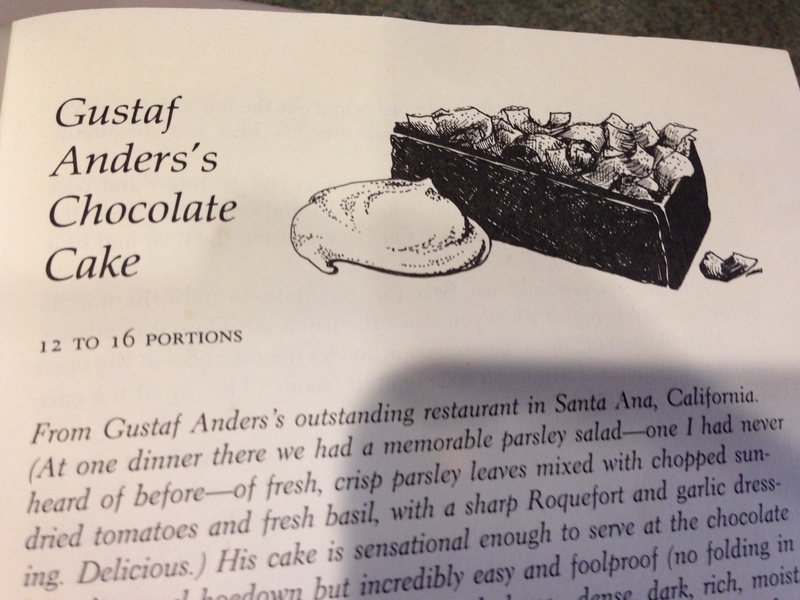 Serve it with a nice loaf of bread and maybe another wedge salad and, of course, something fabulous for dessert. Oh, and don’t forget a chilled bottle of white! 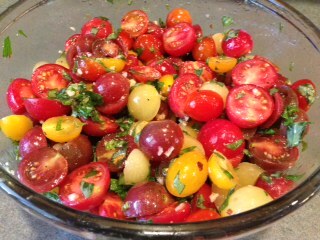 Combine the cherry tomatoes, 1/2 cup olive oil, garlic, basil leaves, red pepper flakes, 1 teaspoon salt, and the pepper in a large bowl. Cover with plastic wrap, and set aside at room temperature for about 4 hours. Just before you’re ready to serve, bring a large pot of water with a splash of olive oil and 2 tablespoons salt to a boil and add the pasta. Cook al dente according to the directions on the package (should be 2-3 minutes). Drain the pasta well and add to the bowl with the cherry tomatoes. Add the cheese and some extra fresh basil leaves and toss well. 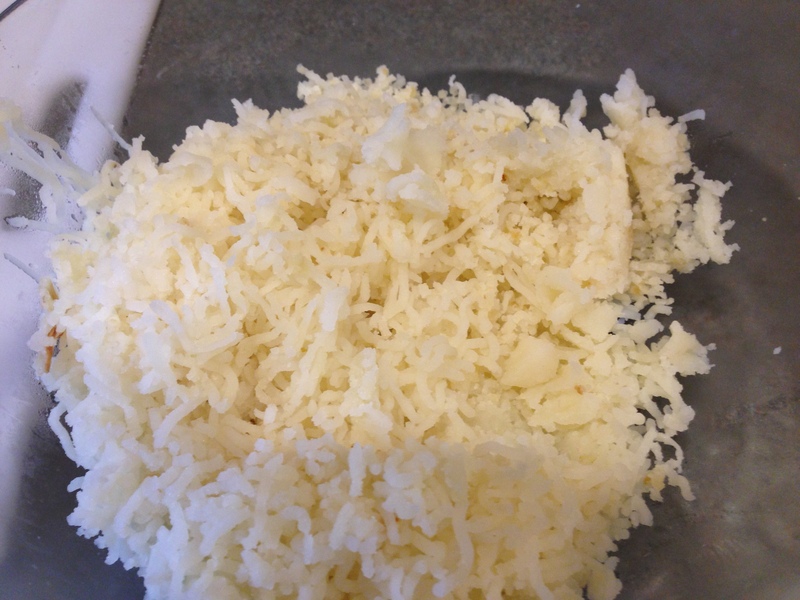 Serve in big bowls with extra cheese on each serving. The smell from this is fantastic! 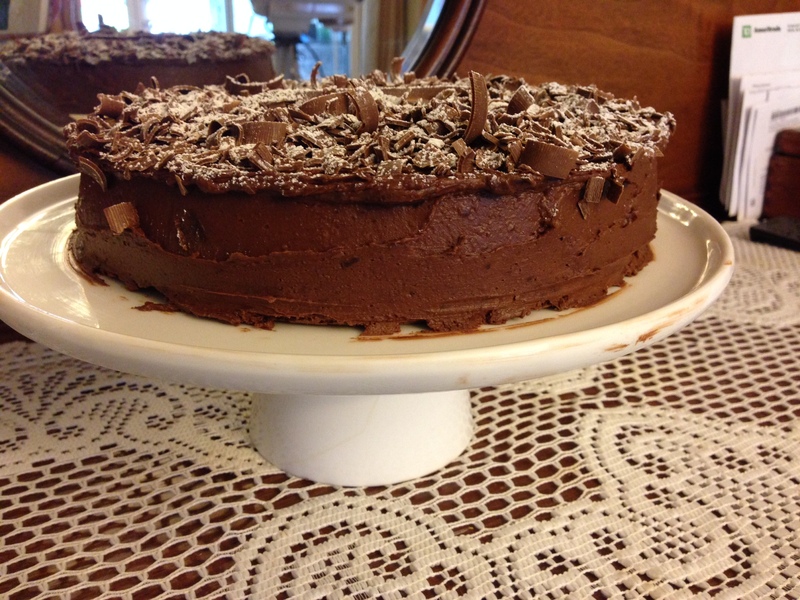 So, when you visit, we’ll sit on my backporch and admire my lovely green grass and I’ll make you this yummy dish! 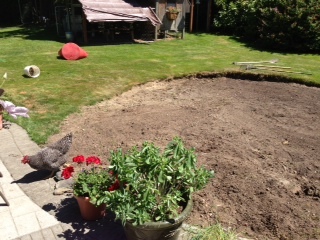 Oh, and there’s still plenty of flower beds to weed–don’t worry, I have extra gloves! Susan on Iceberg dead ahead!